Sibell Vandal Dome HDOC Security Cameras use High Definition Over Coaxial cable Security Camera options, HD-TVI and Quadbrid Cross technology solutions. 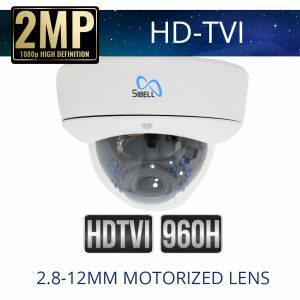 Sibell carries vandal dome security cameras that work with HD-TVI, HD-CVI, AHD, and Analog DVR recorders and our dome cameras come in Motorized, fixed and manual zoom options, adapting to most installation solutions. Vandal dome security cameras are great for indoor or outdoor installation types and offer multiple viewing options and Sibell is a great choice for flexible and adaptable installation situations on a budget.